Sakai Guides and DocumentationTeaching Assistant Guide Gradebook BasicsHow does extra credit work in Gradebook? 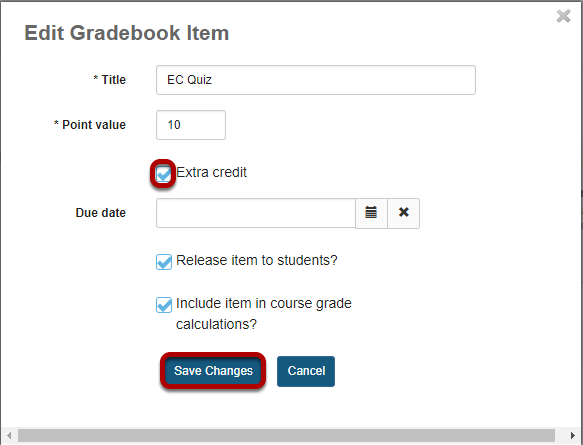 The extra credit (EC) feature in Gradebook can be enabled (1) at the item level or (2) at the category level. For more information on adding items/categories to the gradebook see How do I set up my Gradebook? or How do I add items to the Gradebook? When you designate an item or a category as EC, those items are not added to the total "out of" value for points possible. If students earn points for extra credit items, those points are added on top of the total grade. However, no points will be deducted for students who do not receive a score for extra credit. EC indicates "bonus" items, or optional credit. Note: It is important that you DO NOT make individual items extra credit within an extra credit category. Those items will be considered optional within the category and therefore would have no effect on the overall grade outside of the category. 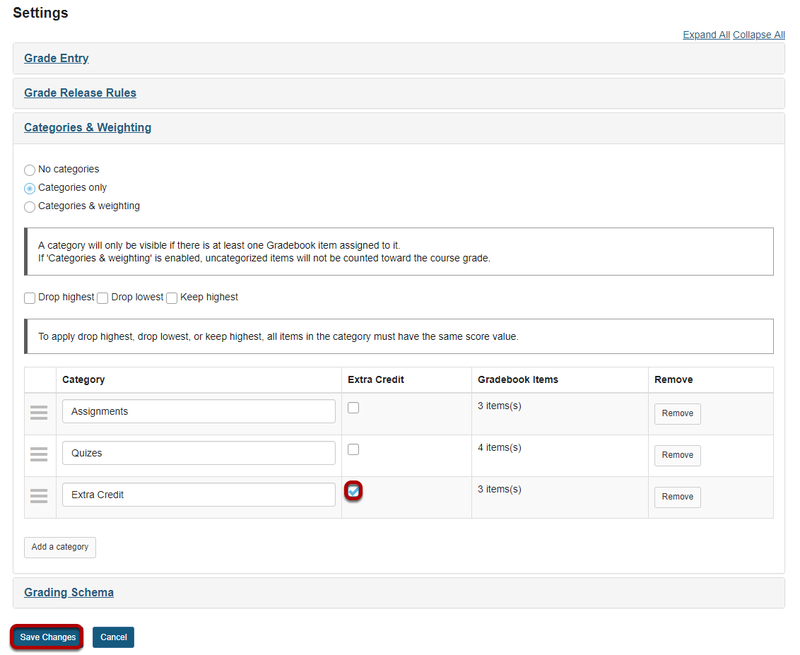 Zoom: Click Edit Item Details for the gradebook item. Check the box next to Extra Credit and click Save Changes. Zoom: Check the box next to Extra Credit and click Save Changes. In Gradebook Settings, add a category and the check the box in the Extra Credit column next to the category. Then, click Save Changes. Zoom: Example: EC item in gradebook with no categories. Let's say you have a gradebook that contains 5 quizzes, 4 of them are for credit and 1 of them is an extra credit quiz. The extra credit item will display a plus icon in the column header to indicate that it is an extra credit item. Quizzes are worth 10 points each. The total points possible for the scenario above would be 40 points possible (i.e. 4 quizzes at 10 points each). The EC quiz does not factor into the total "out of" points possible, so the total points remain at 40. Zoom: Example: EC items within weighted categories. For example, if you have 3 regular assignments and 1 EC assignment in an "Assignments" category that is worth 40% of the total grade, the points for all 4 items (e.g. 40 points) will be added together and then divided by 30 (the total points possible) to result in a category percentage of 133%. Then, 133% will be weighted as 40% of the course grade, which along with other extra credit items, results in a course grade that is higher than 100%. Zoom: Example: EC category only. Therefore, if you have 3 items worth 10 points each in the EC category, and a student earns 10/10 points for all three of them, in addition to a perfect score on all other items in the other categories, the student would have 130/100 points possible, or 130%. Zoom: Example: EC with weighted categories. Notice that, while none of the scores have changed from the prior example, the course grade percentage is now 105%, instead of 130%. This is due to the change in the weighting of the categories. The EC category has a maximum of 5% on top of the total grade (provided that you do not award more than the maximum number of points per item). Next: How do I set up a Gradebook with categories for organization and/or dropping grades?